Raven's Riding Lesson - Super Inky! 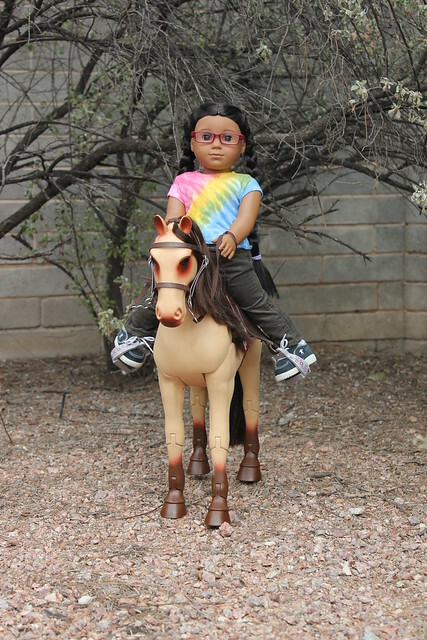 My friend Raven takes horse riding lessons! 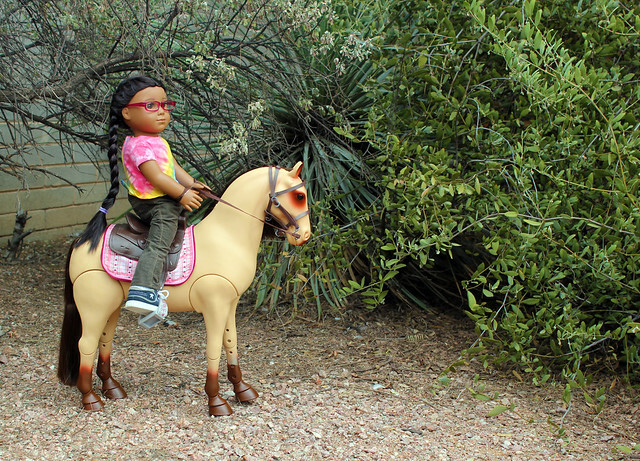 This is Raven with her horse, Misty. Isn't she lucky? There are stables in NYC, but my parents say ballet is enough for me. I would love to try riding a horse someday though. Raven was kind enough to let me and our friend Summer visit her stable so that we could watch Raven ride and take photos. After a while, Summer and I started climbing on all the little wooden structures behind the barn. We were really happy to get the chance to see each other again. However, since I was going back to New York a few days later, we didn't know when we'd get to spend time together again. It's so nice to spend time with friends! 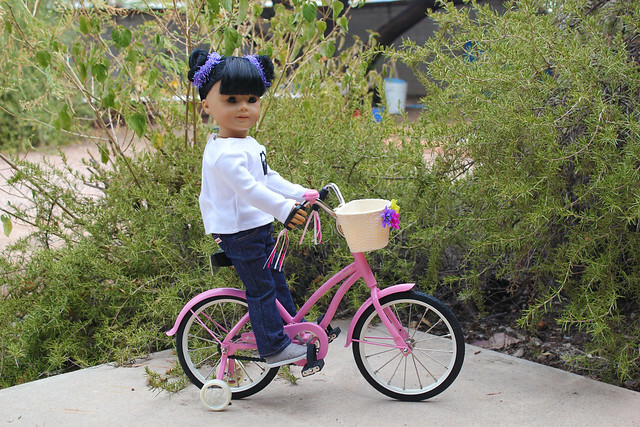 Raven had ridden her bike to the stable and she let me try it. I had to use training wheels! Summer was laughing and laughing. NYC kids don't really ride bikes that much! If anything, we carry around our razor scooters and scoot from place to place. I was a bit embarrassed, but I still had fun! It was a fun afternoon, but I was really sad it was my last one with my Arizona friends for a while. How do you like to cheer up when you are feeling sad about missing a friend? 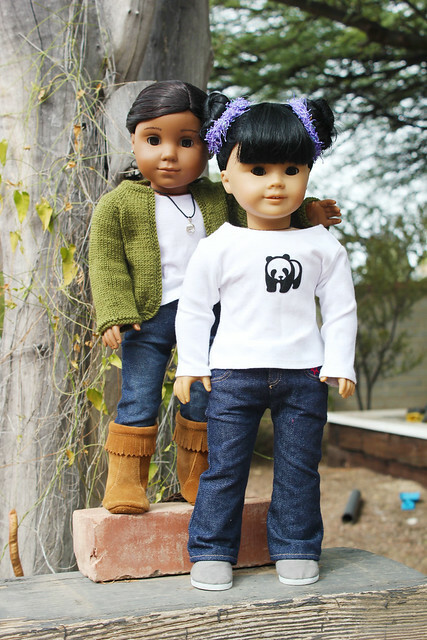 In this entry I'm wearing: panda tee by Cutie Pie & Me, jeans by American Girl, Janes shoes by A Bee Line. Yeah, riding bikes is the best! My mom always gets mad at me when I ride my bike around the city; I'm supposed to take it to the park and ride there. My dad doesn't really mind because he used to do the same thing when he was little. I'm embarrassed to say this, but I'm scared of horses. Sandrine rode a horse before when we visited my aunt and uncle who live in the countryside. When I miss a friend, I just listen to happy music. Music always makes things better for me. I also enjoy watching comedy films, too. I particularly enjoy watching the ones that Lilly likes. It's okay to be scared of horses- they make me a bit nervous too. Violet would really like to take a lesson and I think I might take her up on it because I'd like to get over my fear. We would be lost around here if we did not have our horses, that is when it is really great to live in the country area and have places to ride and horses a plenty. LOL!! We do not ride our bikes enough either, we get so busy with other things that we forget to take some time and ride. I think we would use them more if we had a couple more bikes because then we could ride together. We have one bike for 13 of us, and Nana's kids have one bike too and there are like 10 of them now. Mama has been watching ebay for another bike for us, I am so glad that you got the chance to ride. That is so cool that you know how to ride a horse! You should ask your mama for another bike- then you could have races! That would be really fun. We love horses, too, and it's so much fun to ride them. We watched Felicity's movie the other night and it really made us want to go riding soon! We have to borrow Felicity's and Elizabeth's horses to do that. And OMG! teehee I asked for that bike for Christmas. I sure hope I get it. It looks so cool and fun. I hope you get the bike!! I have Felicity's movie too- it's so cool how she escapes with Penny! Using training wheels is fine! I felt like a big baby since I can't balance without them!